When the brewer has mashed in, he or she needs to separate the sweet wort from the grain husks. This is achieved by lautering and sparging. It's a crucial part of the beer making process. The previous blog was about the ancient magic of the mash tun, where the brewer transforms grain starch into sweetness. The saccharification, a process that is driven by the starch converting enzymes in the partially germinated grain, the malt. At the end of the mash the contents of a mash tun are sweet, with the grain husks mixed up with the liquid. Although the brewer calls it the mash, it has not been physically mashed up, as you would mash potatoes for example. It's more like an infusion, when you put the leaf tea into the pot with hot water, then allow it to mash for several minutes. In the brewer's mash tun you could be fooled into thinking that the grains are still whole - they look as if they are. But the starchy endosperm is gone, what looks like a whole grain is just the husk with very little left inside. Lauter and sparge are wonderful words that mean nothing if you have never done it. They are a crucial part of the transformation of grain into ale. Many beer recipes don't use these words. You are just told to 'collect six gallons of wort'. The writer of the recipe assumes that you know how to do this. Lautering is when you collect some of the wort and then, gently and carefully pour it, or trickle it, through the mash. Keep repeating until the wort runs clear, then collect the clear, strong first runnings. After that, you can begin to sparge. This involves running hot water through the mash to obtain several further gallons of weaker wort. How much wort you collect depends upon how much mash there is in the mash tun and what strength you want the resulting ale or beer to be. 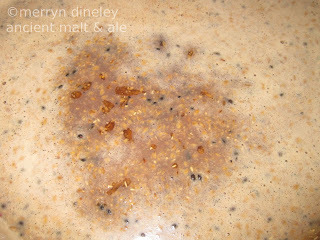 For further details, see the brewer's post about wort which gives specific gravities and more information about wort. 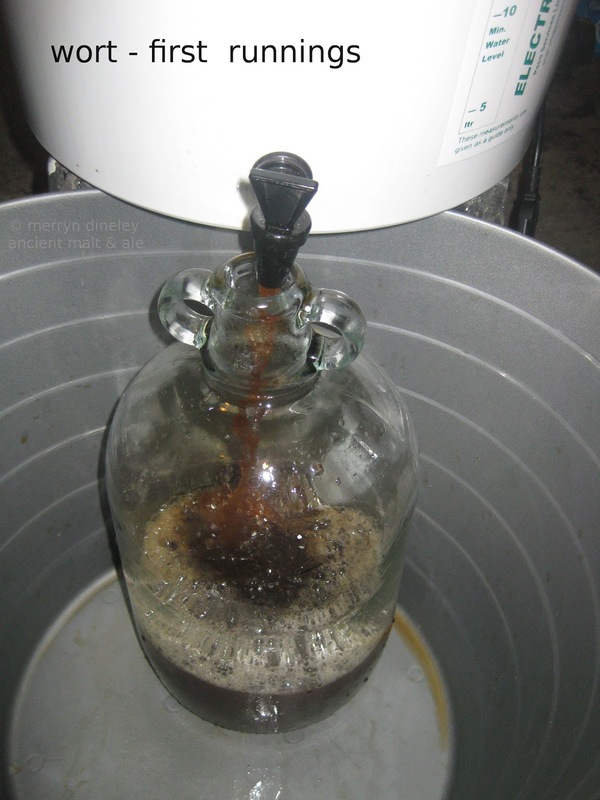 There is a detailed explanation of some of the aspects of lautering and sparging by the brewer and writer John Palmer, from his excellent online book 'How to Brew'. It is,of course, the modern home brewer's perspective and one of the most comprehensive descriptions of how to lauter and sparge that I know of. His next chapter, about the importance of crushing the malt is also well worth reading. The malt that goes into the mash tun should be lightly bruised, as they say in Orkney. Just enough to break the husk but not enough so that it has the consistency of flour. Too floury and you will have a stuck mash. This means that the hot water will not trickle through the mash and it's almost impossible to obtain the wort. No brewer wants that. The interesting thing, for me, is how lautering and sparging was done in the past. Today, a modern all grain home brewer can buy a mashing and sparging bag which sits neatly inside the mash tun. This is how we and many other home brewers mash, lauter and sparge. First, the mash bag is put securely into the mash tun which has a tap near the bottom. Tie the string nice and tight. Add the required quantity of crushed malt and hot water, leave it for about an hour to mash, maintaining the temperature at around 67 degrees Centigrade. When the mash is done, all you need to do is collect some of the wort in a jug and pour it carefully through the mash. Keep doing this until the wort runs clear. This is lautering. Inside the mash tun, the bed of grain has settled and consolidated, creating a natural filter of grain husks that is held in place by the mesh at the bottom of the mashing and sparging bag. Then you run off and collect the first runnings; this is very strong wort, very sweet. 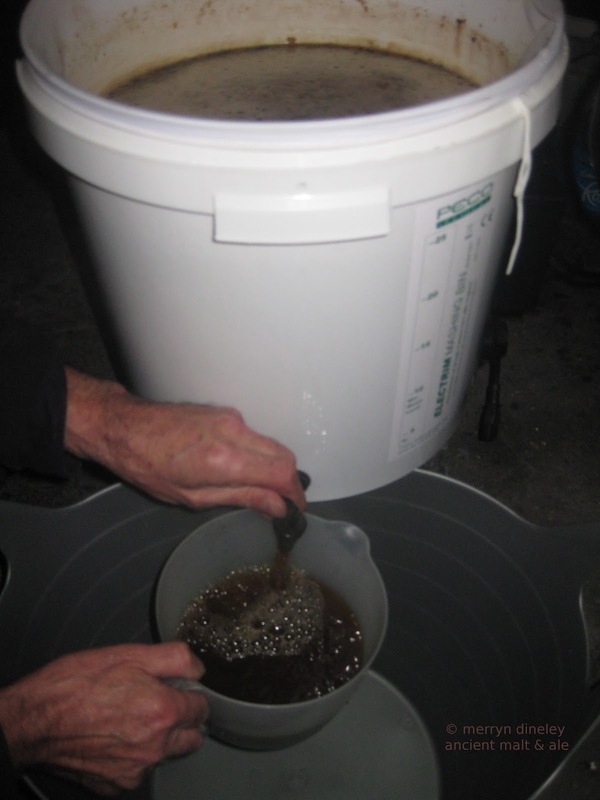 You can collect further wort by sparging. The more wort you collect the weaker it becomes. Hot water is trickled through the mash and several gallons of wort can be collected in this way. It's not absolutely essential to lauter. It's possible to go straight to sparging. 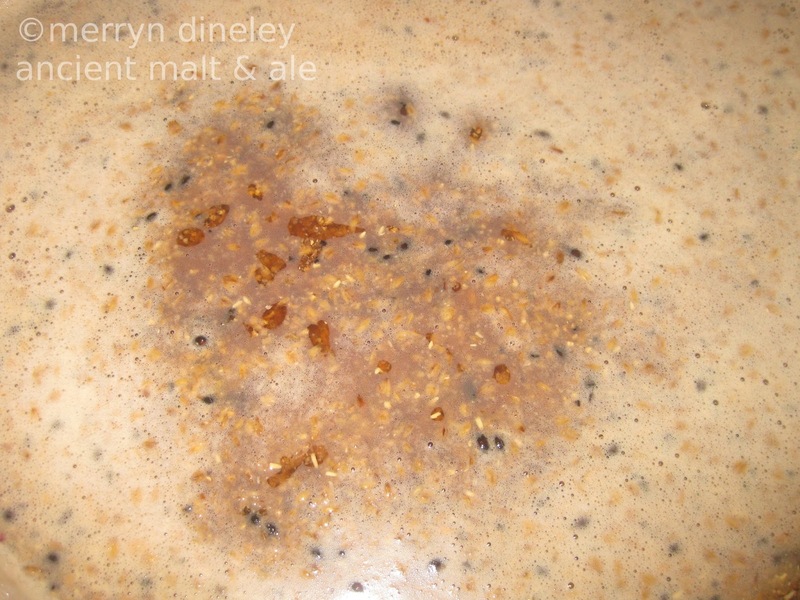 The wort will be cloudy with lots of particles of grain in suspension. Leave it for a while, they will settle at the bottom of the container. In the days before mashing and sparging bags, how did people collect the wort?
" The vat had been prepared beforehand by taking a good handful out from an oat sheaf and spreading it across the tap at the bottom of the vat, and then covering the straw with a stone shaped somewhat like a half moon - the straight side resting on the bottom of the vat and the rounded part fitting snugly to the round of it. The stone would be tilted to an angle of approximately 45 degrees. The stone was to keep the straw in place. Masking is then proceeded with using alternative pailfuls of water from the boiler and the first potful that had cooled off somewhat. If boiling water were put on the malt it was liable to stick - that is, it might all set in a gloggy mass, and no liquid could be drawn off. In the breweries I suppose they will put the water on at a certain temperature; there was no thermometer used here, just guess work." "The vat was allowed to stand for two hours. The boiler was by this time going full swing again ... when the two hours were up it was time to set about drawing off the wort. You put a pail under the tap, pulled out the plug, and, if everything was right, the liquid would run off in a beautiful amber stream. It was a great relief when you saw it was running off clear. The first pailful to be drawn off might have some settlings or groot in it - that is some of the dust or fine stuff out of the malt - so you would tip that pailful back into the vat, for the groot would take a long time to seep to the bottom of the vat again." I first came across this description of traditional mashing, lautering and sparging techniques when I was doing research in the Orkney Library over ten years ago. At the time I didn't imagine that there might be corroboration or that there are brewers still using these techniques today. Not in Orkney, but in Norway, Lithuania and Latvia. The tradition of making farmhouse ale continues in these, and other, countries and it's possible to meet the brewers and see how they make malt and ale, thanks to this blog by Lars Marius Garshol. He has been visiting them, talking to them and writing about them. It is wonderful research. Straw, juniper branches and even raspberry canes can be used to help create the filter bed in the mash tun. In this blog, Brewing in Morgedal, Lars tells the story of how he found farmhouse brewing alive and thriving in eastern Norway. The brewers, Halvor Bjåland and Terje Haugen and their apprentice, Bjørn, make ale in the way of their ancestors. I am sure that these methods and traditions go back to medieval times, to the Viking era even. In this blog you can see photographs of the brewing process, including the stones at the bottom of the mash tun holding down the juniper branches and you can see the wort being collected by sparging. In another of Lars' blogs he writes about farmhouse brewing in Denmark. Here the tradition has almost died out, but not quite. There are some great descriptions and images of lautering and sparging, using hot water and large wooden tubs as mash tuns. I recommend reading through his blogs. It might take you a while, there is a tremendous amount of detail. It's valuable information and an important record of local traditional malting and brewing. Archaeologists and anthropologists, as well as maltsters and brewers, would benefit from reading, at the very least, some of these blogs. It tells a story that relates to the history and prehistory of making malt and ale in Northern Europe. Excavations at Must Farm in the Fens of England are drawing to a close. Here, archaeologists from the Cambridge University Archaeological Unit are slowly uncovering a very well preserved Bronze Age village. It seems that there was a fire, the houses and contents burned and have been preserved in wet anaerobic conditions. Archaeologists are finding the remains of wooden buckets, pots with food contents intact and worked wood. Why should a fairly large Bronze Age pot contain these two organic substances? Could it be that the pot was being used in part of the ale making process? Not being involved in these excavations myself, all I can do is speculate. At this moment, I can't think of another reason why the pot contained fibrous material and grain, but there may well be another explanation. Please let me know what you think this might be. That's all for now, in the next post I shall be looking at how to sparge when you are mashing in a large trough in the ground.